Economic opportunities provide women with life options, greater participation in decision-making and more equity within the household. As a result, they are assumed to protect women against gender-based violence. 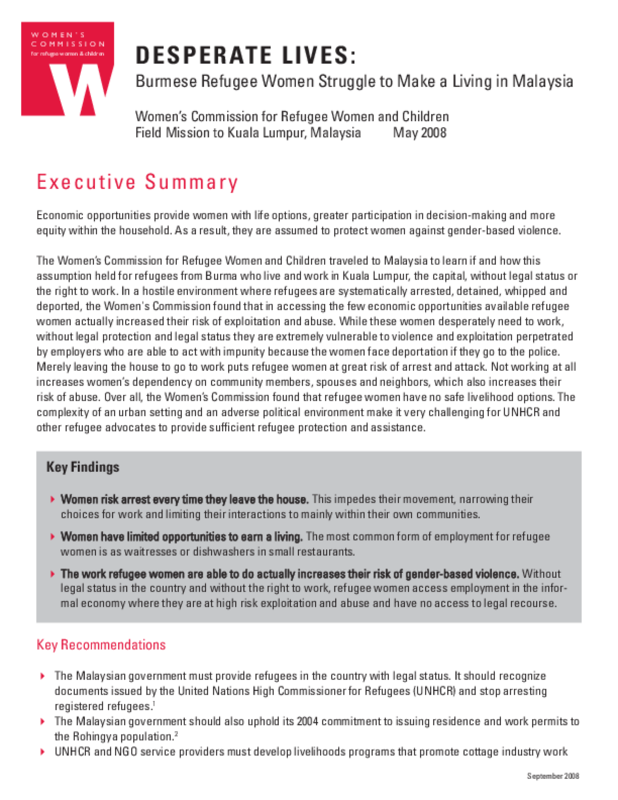 The Women's Commission for Refugee Women and Children traveled to Malaysia to learn if and how this assumption held for refugees from Burma who live and work in Kuala Lumpur, the capital, without legal status or the right to work. In a hostile environment where refugees are systematically arrested, detained, whipped and deported, the Women's Commission found that in accessing the few economic opportunities available refugee women actually increased their risk of exploitation and abuse. While these women desperately need to work, without legal protection and legal status they are extremely vulnerable to violence and exploitation perpetrated by employers who are able to act with impunity because the women face deportation if they go to the police. Merely leaving the house to go to work puts refugee women at great risk of arrest and attack. Not working at all increases women's dependency on community members, spouses and neighbors, which also increases their risk of abuse. Over all, the Women's Commission found that refugee women have no safe livelihood options. The complexity of an urban setting and an adverse political environment make it very challenging for UNHCR and other refugee advocates to provide sufficient refugee protection and assistance. UNHCR and NGO service providers must develop livelihoods programs that promote cottage industry work women can do from home that link women to sustainable income. Female headed households and young single women should be targeted for these programs. Women risk arrest every time they leave the house. This impedes their movement, narrowing their choices for work and limiting their interactions to mainly within their own communities. Women have limited opportunities to earn a living. The most common form of employment for refugee women is as waitresses or dishwashers in small restaurants. The work refugee women are able to do actually increases their risk of gender-based violence. Without legal status in the country and without the right to work, refugee women access employment in the informal economy where they are at high risk exploitation and abuse and have no access to legal recourse. Copyright 2009 Women's Refugee Commission. All rights reserved.